Types of Sheath:- SS304, SS316 etc. 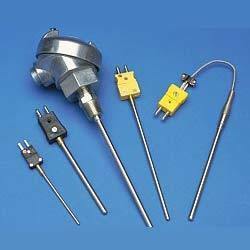 We are Leading manufacturer of various temperature sensors like RTD, Thermocouple Thermo-well. Spectrum is committed to supply quality products. We bring forth vast industrial Matching up with the exact requirements of customers, we are involved in presenting a wide array of Sheathed Thermocouple (Sheathed Handheld Thermocouple). - Type: J, K, T, E, N etc. - Protection Sheath: SS 304 / SS 316 / SS 310 / Inconel 600 / HRS 446 Ceramic etc. depending upon temperature & applications. - Morgan Blue Lighting Thermocouple sheaths are available with either 1/2" BSP, 3/4"NPT pipe. - Non Wetting, High Conductive, Robust design, Assembly also available. Our clients can avail us a wide range thermocouples. With our rich expertise, we are offering Thermocouple Sheathing that are manufactured using silicon carbide and molybdenum di-silicide and is used for immersion in aluminum bath for molten metal temperature control. We are one of the reliable companies in this domain and are into offering Quartz Thermocouple Sheath. Ceramic Sheathed Thermocouple is offered by us in a range of Ceramic Sheated with PCD 70 Flange Thermocouple, and High Temperature Ceramic Sheated Thermocouple. It is used for applications having temperature up to 1600oC, particularly in kilns, furnaces, and flues. The type ALSTE is the extension of type AL to a connector. This may consist of a miniature connector or standard connector or a connector with gold plated contacts. Miniature - or standard plugs have contacts from thermocouple material. The outer body made of heat resistant plastic. Tempko Temperature Meaesurment Pvt. Ltd.
METASHEAT are world renowned for their outstanding performance in the non-ferrous molten metal industry. 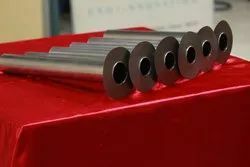 Its unique combincation of physical properties suach as high strength, toughness, excellent thermal shock resistance and resistance to corrosion make it the stand out material in this application. Hitemp thermocouple sheaths are used as protective covering over sensing elements. So that the elements are protected from the injurious effects of the furnace atmosphere. These thermocouple sheaths are manufactured either by slip casting or by extrution. Vacuum Extruded thermocouple sheaths are dense & highly impervious & give better life compared to conventional slip casted ones .